Freshman year of college is officially over! We moved back home this Tuesday. It feels good to be home, but we’re going to miss school and our friends who live throughout the country this summer- it’s certainly an adjustment going from being surrounded by thousands of other people your age to being with your family again (wonderful people as they are!). One plus, though, is we will have time to get back to blogging. In honor of coming home, we made a very decadent cake this past Wednesday which we’ll be sharing soon, but first, something a bit healthier- kale pizza! Even if you’re not a fan of kale, I would really encourage you to give it a try here. Anything is improved by cheese and carbs, right? 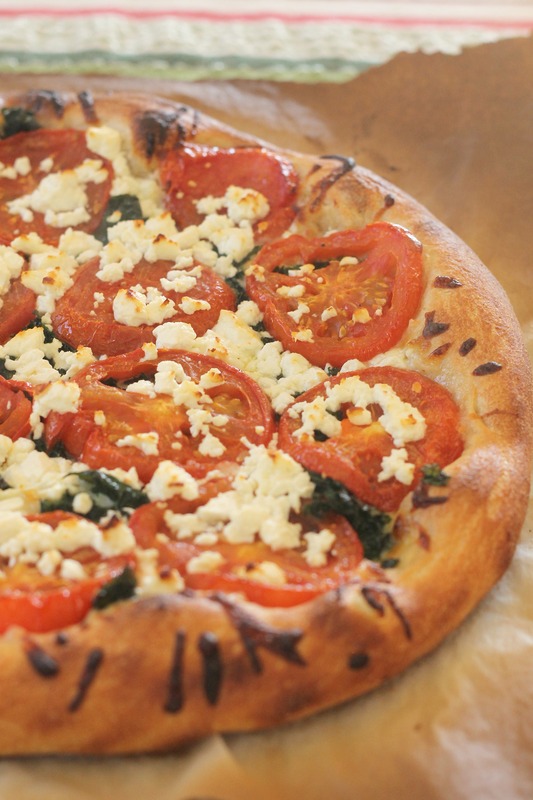 Especially when the cheese is feta and the carb component is homemade pizza crust! Roasted tomatoes add a nice touch, as does the garlic oil that serves as the sauce base. As we approach summer and tomatoes get better, they’re best fresh, but the ones around here aren’t quite there yet and roasting brings out their flavor. Give this pizza a try! P.S. We made an Instagram for our blog! Follow @weliketwocook if you’d like! Preheat the oven to 300˚ F. Line a baking sheet with parchment paper. Slice the tomatoes into slices that are about ½-inch thick. Lay the slices in a single layer on the prepared baking sheet. Drizzle with a little olive oil, sprinkle with a pinch of sugar, and season with salt and pepper. Bake 50-60 minutes, flipping the slices halfway through baking, until roasted and lightly browned. Transfer tomatoes to a plate lined with paper towel and refrigerate for several hours until excess liquid is drained. In a small skillet, combine 2 tablespoons of the olive oil with the garlic and red pepper flakes. Warm over low heat for about 10-15 minutes and then remove from heat and set aside. In a medium skillet, heat the remaining 2 teaspoons of oil over medium-high heat. Add the kale to the pan and cook, stirring occasionally, just until the leaves are wilted. Remove from heat and set aside. Heat the oven to 500˚ F and preheat a pizza stone for at least 30 minutes (the longer you heat your pizza stone, the better your crust will be!). Roll out or press the pizza dough into a 12-14 inch round. Brush the dough with the garlic-red pepper oil. Sprinkle the shredded mozzarella over the dough. 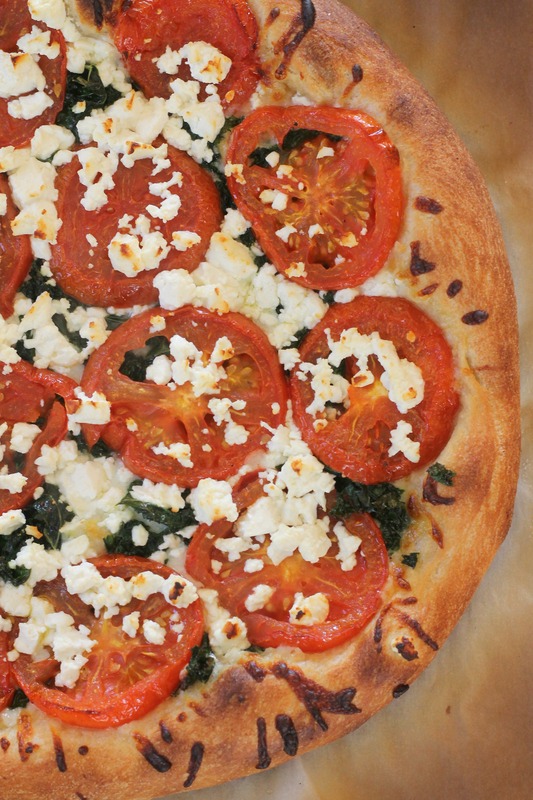 Top with the wilted kale, roasted tomato slices, and feta. Transfer the pizza to the preheated pizza stone and bake until the cheese is melted and bubbling and the crust is lightly browned, about 11-12 minutes. Remove from the oven and let cool slightly, then slice and serve. Enjoy!